Batman stands today as one of the most recognizable characters in pop culture, and along with the Batcave and the Batmobile, Gotham City itself stands as one of the most identifiable aspects of Batman lore. This trade explores not only the history of the city but its dark secrets and deadly denizens as well, giving readers a whole scale look at world of Batman. Writer Scott Snyder (AMERICAN VAMPIRE) teams with Kyle Higgins to pen the story, which features various members of the Batman family uniting to solve a mystery that travels through multiple eras of Gotham City. When a mystery as old as Gotham City itself surfaces, Batman assembles a team of his greatest detectives – including Red Robin, Owlman, I-Ching and others – to investigate this startling new enigma. As clues are discovered and the mystery deepens, Batman's team soon finds itself on a journey that explores different eras in Gotham's history and touches upon notable Gotham families including the Waynes, Kanes, and Elliotts. This miniseries spins out of recent events in the Batman titles and sets the stage for several exciting storylines in 2011. 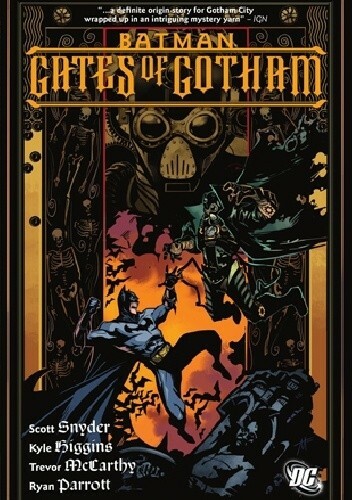 This volume collects all five issues of the BATMAN: GATES OF GOTHAM miniseries and also includes BATMAN ANNUAL #28 and DETECTIVE COMICS ANNUAL #12.